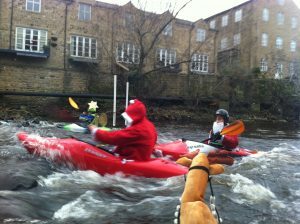 Put on a Santa suit and come for a paddle! Ok so you may have seen Santa Runs happening in various places where everyone puts on a Santa Suit and goes for a run. But why run when you can paddle? So we are going to do a Santa Splash!! When: 1pm meet to start on the water at 1:30pm, until about 3pm. Parking – it is likely to be busy in town so come early to find a parking space (try the industrial estate towards the cricket club).